Editor’s Note: I’m leaving for my trip to Kauai this Friday so I thought it would be the perfect time for this post. Aloha! 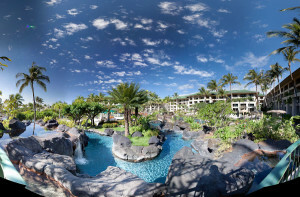 And yes, that is our hotel in the picture below and that is a lazy river! Some people probably think I’m crazy for holding 22 credit cards in my wallet but I have a good reason for doing so. Ok, I don’t really have them all in my wallet, I keep them in a little box in my drawer but you get the point. The reason that I love signing up for credit cards though is because of the amazing tax-free sign up bonuses. Even though I’ve signed up for that many cards, I’m still at a 750+ credit score and I’ve never been denied for a card. So don’t believe it when you hear people say that signing up for credit cards is bad for you. These people don’t know what they’re talking about and as long as you keep things in moderation you’ll be just fine. I’ve already talked about my first app-o-rama and recently I decided to put some of the points from that sign up spree to use. Even though I’m trying to save up as many points as possible for our honeymoon next summer(2014), when I saw this recent deal pop up I had to pull the trigger. At last count, I had over 600,000 points spread across Amex MR, Chase UR, Citi ThankYou, Barclays, Hyatt, American Airlines, United, US Airways and Delta so there are still plenty of points left for our honeymoon. Since my fiancee is in med school now, it’s a lot tougher for us to travel using rewards points since she can only take time off during breaks from school(which usually coincide with peak travel times). Award booking can be very tough during these times but it is still doable if you plan far enough in advance. I did not do that for this trip though, instead, I got pretty lucky. I was reading one of my favorite travel blogs(The Points Guy) when I saw a post about discounted American Airlines Award Seats to Hawaii. Sure enough, I checked and there were seats available in December from Southern California to Hawaii for only 15k points each way. There was actually a ton of availability leading up to Christmas but I had to check with my fiancee first. The total cost for both flights would have been $1,214 if we paid in cash but since we paid in points, it was only 60,000 points. That’s a pretty solid redemption rate of 2.02 cents per point. Usually you can redeem 1 cent per point for gift cards/cash back but if you redeem for travel, the ratio can be much higher, as is the case here. Even though there’s a ton of stuff to do in Hawaii, there’s something about coming home to a nice room after a long day or waking up and having breakfast on the lanai overlooking the ocean that makes my wallet melt. Normally, I would never shell out the big bucks for a nice ocean view hotel room but on my last trip to Maui I did it and it was well worth it. I managed to find a great deal but it was still a $300+/night room. On this trip though, I wanted to pay for the entire hotel stay with points so I knew an ocean view room would be tough to get. Usually, when you pay with points it’s tough to get anything other than standard rooms. 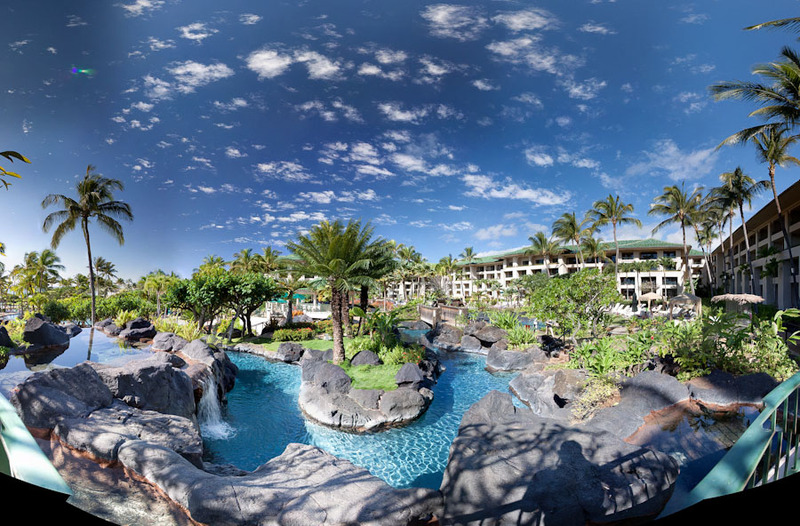 I ended up deciding on the Grand Hyatt Kauai because it is a very highly reviewed hotel and I have a combination of Hyatt points, Diamond membership and free award nights with them. And they have a lazy river, that definitely sold me! I really like the way Hyatt’s hotel points system is set up since you can redeem just 22,000 points for a room at any Hyatt worldwide. Some Hyatts in Europe go for up to $700-$800 a night during peak times(for just a standard room) so you can see how valuable Hyatt points can be. At the time of booking though, it was only $329 for a basic pool view room. Since I already had about 8,000 points in my Hyatt account I transferred over 58,000 points which would cover three of the four nights and for the fourth I decided to use a free award night I had from a recent sign up bonus. About a month ago I signed up for the Chase Hyatt Visa which gave me two free award nights after spending $1,000 in 3 months. Since I was a Hyatt Diamond member at the time of sign-up, the award nights became suite nights so I got two free nights in a suite at any Hyatt property in the world. I would have used both nights at the Hyatt Grand Kauai but they only had a Garden Suite available on the third night so I booked it. So the first, second and fourth nights will be in a regular pool view room but I’m hoping that they’ll let us stay in the suite for the fourth night instead of making us move. This depends on availability but it’s been known to happen. At the time of booking, the garden suite was $881. Normally, I book rental cars through Costco Travel but for this trip I wanted to try and use points for everything(except food and entertainment). I remembered hearing a tip that the Citi Thank You Network offers really good redemption rates on car rentals so I gave it a shot. Costco travel quoted me at $234 for a fullsize car for 5 days while Citi only charged me 14,430 points for the same fullsize car. Citi points are very tough to redeem for better than a 1:1 ratio so I jumped on this opportunity. I booked with Citi at a redemption rate of 1.62 cents per point(23,400 cents/14,430 points). We ended up getting the hotel rooms for 66,000 points and 1 award night(22,000 points). The total value of the hotel rooms is $1,868($329*3 + $881), so that’s a redemption rate of 2.12 cents per point(again, a pretty good redemption rate). The airline tickets would have cost $1,214 but since we booked them for 60,000 points all we had to pay was $10 in fees. The car rental was also a good deal at 14,430 points. After all was said and done, I booked the flight, hotel and car for two people for 5 days/4 nights for just over 162,000 points. If I would have paid in cash, the trip would have cost me $3,316. I ended up using points from my Chase Ink Bold sign-up bonus, 1 of the 2 award nights from my Chase Hyatt Visa, all 50k of the points from my Citi AA Visa sign-up bonus and 10k from another Citi AA Visa sign-up bonus, and 14,000 points that I accumulated from my Citi Checking bonus. I’m pretty excited for this trip and knowing that it’s going to be free makes it even better. Plus, there’s nothing better than getting paid while you’re on vacation! Readers, so what do you think about all the work I put into this? Was it worth it for a free trip? Have a blast man! My 4 week business offsite in Oahu is coming to an end. Used my travel card and at least it’s a business expense. Gotta go to Hawaii to write authoritative posts about Hawaii after all. Gotta love the direct flights from CA! Thanks bud, this is my first time to HI in the winter so I’m curious to see what the weather will be like. Hot and rainy I bet 🙂 Maybe you need an assistant for your next ‘business trip’ to HI? Just let me know and I’ll be there haha. The direct flights are awesome, I’m 6’3″ and I don’t even mind sitting in coach for 5 hours if it’s on the way to HI. Watch a couple movies and you’re there. Wow – flights, hotel AND rental car. Awesome travel trifecta of points freebies! I originally just wanted to get miles for tickets to Aspen from NYC – served only by United, always $500-$800 per ticket, or 25K miles. Well I got totally addicted to free flights…in business class… Really, all I meant to do was get 4 RT flights to Aspen with two CC sign-up bonuses, and now I’m a total milewhore. Like you 🙂 Enjoy! Thanks! This is definitely my biggest all at once redemption to date. 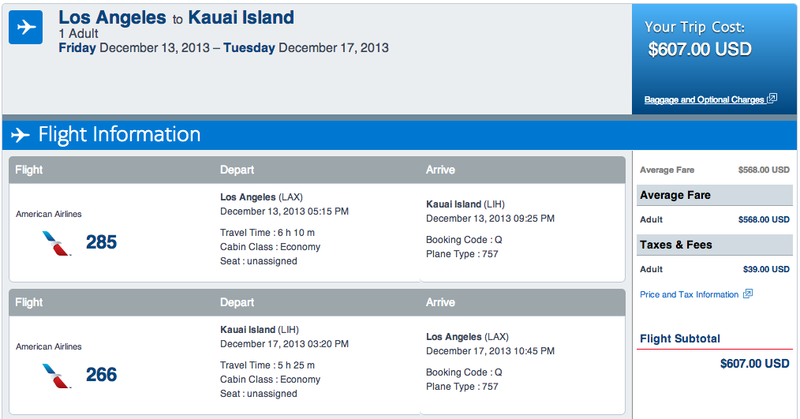 I did bus/first to Maui 2 years ago with points(75k per RT on AA) and it wasn’t anything special. I’d rather just save the points and fly coach domestically. International biz class is another story though! Have you started reading FT and all the points blogs? They make me look like a total noob at travel hacking. That is so awesome! But here’s my question, how do you keep track of all these points from your 22 different cards??? The real work is researching which cards to apply for, how to hit the spending and how to redeem the points. But that’s the fun part in my opinion. It’s more of a hobby for me, a very rewarding hobby. Can you do a post on your spreadsheet? I need a free vacation right about now. Haha free vacations are the best kinds. Log on to your Citi account and see if there’s a rewards section. It should list how many points you have, you made sure to hit the min. spend in 3 months or whatever the terms were right? Which card/deal was it again? Try to redeem the points for at least 1 cent per point. Citi points are best used on rental cars and gift cards for various merchants but you can use them on travel and hotels. Great read!!! Everything you say is true regarding the having a large amount of credit cards. I’m on credit card #18 (Discover It), they have a 150.00 cash back bonus. Additionally, they have this online portal to stores like Macys.com… and they allow you to shop from the portal. For example. If I buy $100.00 worth of clothing, I can use my 25% off macys coupon (it begins tomorrow), bringing it down to 75.00, If I go through Discover portal, I get 10% cash back, that’s 7.50. Additionally, I get 5% cash back based on the normal rotating category of “online spending”. So, it was a great time for me to get that card… I know I went on a tangent there, but man, great job on maximizing the points on that vacation! Thanks C. I actually don’t have a Discover card yet but you’re totally right. Discover tends to have lower sign-up bonuses but much better cash back bonuses. It’s nice when you can combine multiple promotions. nice, I’ll have to check that out. thanks for posting. I didn’t list the Macy’s one but it should be in your amex my offers tab(ymmv though). I love Kauai, so I know that you will have a blast. My one recommendation is to visit Queen’s Bath while you are there. It is AMAZING! We have churned a few cards but recently stopped. We plan on starting up again soon. Nice, thanks for the recommendation. I’ll be sure to check it out. Yea I’m kind of addicted but in a good way. I know my limits and I do lots of research before/after my App O Ramas in order to keep my good credit intact. Have you done the Hilton Honors Amex? I keep getting emails about signing up but I want to finish my churn on the Chase Sapphire first. Disneyland is close to LAX so no worries about that part. I’ve found the best rates through Costco travel for car rentals if you’re going to pay cash. Otherwise, Citi has the best points redemption rates for car rentals. I haven’t done the HHonors and I know they recently devalued the points so the rewards aren’t as valuable. I’d stick with the SPG or Hyatt(Chase) points though – nicest hotels and best redemption rates! just kidding, I’d have 40 too if that were earning me points, sadly European cards aren’t half that good! Haha well since US CC companies are amazing when it comes to fraud reimbursement go for it. I’ll even give you a day head start before I report them stolen. But yea I don’t know what I’d do if I lived outside the US and couldn’t take advantage of all these awesome offers. Good job! I wish I would have that many points by next summer! Your prior posts inspired me but I only did two cards — the 50k AA miles from Citi and 40k miles from the Arrival card. Nice that you got in on the Hyatt top tier at 22k points! That isn’t going to last much longer. Yea I heard, that was a really sweet deal while it lasted. I never got to redeem at a nice Euro Hyatt but I think I got pretty good value out of these rooms and obviously the suite night in HI. There is a suite available on that last night when I look at their rooms online so hopefully they will let us stay in a suite the last night for free. Definitely going to play the honeymoon card since I heard newlyweds get a free bottle of champagne, free cabana rental and a couple other perks. Thanks for the “book end” tip, I’ve never heard of that but it totally makes sense! That’s amazing! I’ve never been to Hawaii but I’ve heard it’s gorgeous. I need to do a little more research about all the reward cards. I hadn’t been signing up because I didn’t want my credit score to drop, in case we decide to buy a rental property in the next 6-9 months, but if I can keep the score up and do the free travel at the same time, I’m all about that! If you only apply for a card here and there, there will be almost no change to your score. I don’t plan on getting a mortgage in the immediate future so I’ve been doing a lot more apps than normal. Will probably slow down in the next year or so since that situation may change. Ha! I don’t have one credit card. I keep thinking about getting one for the rewards, but I’ve gone 15 years without using credit cards. Paying cash is a hard habit to break! We are Hilton Honors members and have earned quite a few free hotel stays. I thought it was crazy that our rooms in Barcelona used the same number of points as rooms in a Hampton Inn in a tiny little town in North Carolina. Regardless, it is very nice to know my husband’s business travel pretty much earns us free hotel rooms wherever we go each year. Well thank you for subsidizing all my purchases 🙂 Gotta do what works for you. Cash back pales in comparison to some of the sign up bonuses you can get. It’s a little bit of work to keep track of it all but I think it’s worth it when you can get a $3k vacation completely paid for. I am a huge fan of travel rewards cards and travelling for free with points and credit cards. Lots of people use these cards in a bad way , so they are only valuable if you can use them and not pay interest.